A domestic drama, The Other Woman adopts the perspective of the homewrecker but gets hopelessly lost in numerous emotional sub-plots. 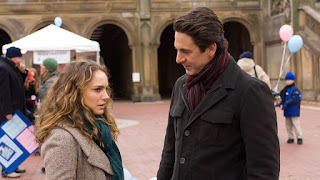 In New York City, Emilia (Natalie Portman) is the second wife of lawyer Jack Woolf (Scott Cohen). She was a junior associate at his firm, they had a torrid affair and she broke up his admittedly unhappy marriage to respected doctor Dr. Carolyn Soule (Lisa Kudrow), who nevertheless remains deeply resentful about Emilia stealing her domestic life. But Emilia is now having troubles of her own. She is still grieving the death of the newborn girl she conceived with Jack, and having trouble connecting with Jack's eight year old son William (Charlie Tahan). Emilia is also harbouring anger at her father Sheldon (Michael Cristofer), who cheated on her mother Laura (Debra Monk) and then abandoned the family. Although Emilia makes some progress with William, the numerous tensions threaten to overwhelm her happiness with Jack. An adaptation of the Ayelet Waldman book Love and Other Impossible Pursuits (the movie is also known by this alternate title), The Other Woman is an overclocked and over-emotive melodrama about the problems of rich people. It's not much of an oversimplification to summarize the film as Emilia saying or doing the wrong thing, aggravating everyone around her, apologizing profusely, then purposefully striding into the next idiotic blunder. The kid William, irritating as he is, frequently demonstrates the more mature behaviour compared to his step-mom. The film jumps from one emotional arc to another, loading Emilia with overwhelming distractions. Her various roles include homewrecker, grieving mother, hapless stepmother, helpless victim of the angry first wife, and angry daughter clueless that she is mimicking her father's behaviour. While in book form the multiple agonies may work, script writer and director Don Roos is unable to find a cohesive focus for a 100 minute movie, his central character sent spinning in numerous directions and getting exactly nowhere. Some level of watchability is maintained by Portman and Kudrow. Both battle gamely against the inherent weakness of the material, and occasionally shine in portraying the gamut of emotions as two women unwittingly caught on either side of the same man. Scot Cohen is unfortunately a relative blank slate. The Other Woman tries to carry too many burdens, and drops most of them in an uncoordinated clang.